Washington (CNN) – Democratic Senator Richard Blumenthal blocked a non-binding abortion resolution on Wednesday offered by Republican Senator Mike Lee saying, "This problem is broader than the issue cited in Senator Lee's resolution." Introduced to the Senate on Monday, Lee said his resolution was in response to the trial of Philadelphia abortion doctor Kermit Gosnell, who is accused by authorities of killing four babies born-alive during botched abortions. The measure calls for a review of abortion policies to prevent these sorts of incidents from occurring again. Blumenthal criticized Lee's resolution saying it focused too narrowly on abortion medical misconduct, and should instead focus on all instances of patient safety. He cited as examples an Oklahoma dentist who exposed 7,000 patients to HIV and Hepatitis B and C through unsanitary practices and a nursing director in California who inappropriately medicated patients using anti-psychotic drugs, resulting in the death of a patient. 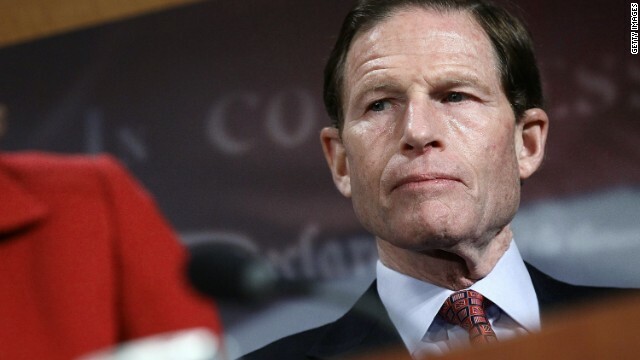 "These incidents as alleged are willful violations of law, violations of human dignity and decency that ought to shock the conscience of the nation every bit to its core as much as the alleged misconduct and potential criminal activity in Pennsylvania," Blumenthal argued. Blumenthal introduced his own resolution as an alternative solution, saying it would take as common ground the alleged Pennsylvania misconduct and also include other instances where basic standards of care, decency and trust are violated. "What I'm suggesting is a resolution that includes those criminals who may be posing as health care practitioners in one field of practice but extends the condemnation to all areas of practice." Blumenthal also argued that the wording in his resolution did not focus on Gosnell, who has yet to be prosecuted. Lee's office released a press release Wednesday in response to Blumenthal's objection, which blocked Lee's resolution from receiving unanimous consent to proceed to a vote in the Senate. "It is difficult to imagine why anyone would object to a non-binding resolution calling on Congress to investigate these alleged disturbing, horrific, and illegal abortion practices committed by Kermit Gosnell and others," said Lee in the press release. According to The Hill newspaper, Lee objected to Blumenthal's alternative resolution saying he didn't have time to read it before it was offered. Egads.... this clueless Democrat equates the willful murder of babies born and struggling to stay alive, only to be murdered by having their spine cut by a "health care provider" in a late term abortion mill to dentists reusing dirty dental instruments??!!! How blind and brain dead have the Democrats become in their defense of abortion, or in the case of Gosnel, out right murder??? Thank you Sen. Blumenthal. I like Sen. Blumenthal's proposal better. Mr. Lee's proposal is noting but an attempt to undermine Roe v. Wade. so when blumenidiot was talking about "patient safety" was he referring to the babies born alive and then murdered by gosnell and his helpers? was his concern that the scissors used to kill them had not been sufficiently sterilized? or was he expressing concern for the woman who died in his clinic from being anesthesia by a totally untrained person that the doctor had hired and knew was qualified? so much for safe and legal huh liberals??? and why weren't these murder mills being inspected by the states? 17 years without an inspection? the state of pennsylvania was partly responsible for this horrendous murder mill. why hasn't obama and the democrats called for an immediate inspection of all of these facilities? if you can save just one life right? where is your concern for children now democrats? is it ok to die by scissors severing your spine? Way to go Blumenthal!! We all see exactly what Mr. Lee is attempting here, and it just won't work!! just asking, guess who can call investigations too? The House of Representatives! They called one on the witch hunt that is the Bengazi "scandal." Why haven't THEY brought up the issue of abortion to the house floor yet? Thank you Senator Blumenthal. Trying to undermine Roe v Wade is not the way to go. Good legislation is specific and actionable. Mike Lee's resolution addresses a problem that clearly exists in Pennsylvania and is likely to exist in other states. It's also a good step in the right direction when it comes to protecting patient safety, which appears to be Blumenthal's larger concern. Jesus said a sparrow does not fall to the ground unless my Father wills it. Also, there is a way that seems right to man but the ends thereof are death. Just maybe God,who has all control, has willed for the pregnancy to be terminated since before the beginning of time. He controls all things and it is very presumptious of man to act as if they know the will of God. Abortion is a personal matter between a woman and her healthcare provider. If it is a sin than they will have to answer to Jesus.